If you are in your absolute element when meddling about in the laboratory at school, you should think about continuing in the field and becoming a medical laboratory scientist. 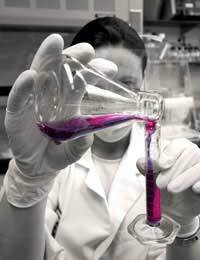 Clinical laboratory scientists or technicians are essentially detectives in health care. They work in an investigative role within the laboratory, where they uncover important health information for patients. By analysing laboratory samples and helping medical doctors to accurately diagnose disease in patients, a laboratory scientist plays a vital role in ensuring that patients receive the appropriate diagnosis and treatment to give them the best outcome possible. Laboratory scientists will also perform routine tests to monitor a patient's illness, which can help a physician decide when and how to adjust a medication regime. First and foremost, a studious and unwavering attention to detail is mandatory for a successful career as a laboratory scientist. You also need to enjoy science and be comfortable in the laboratory as well as having a strong respect for safety. In the medical laboratory, carelessness can result in severe injury or fatality to you and those around you. Another important aspect of this kind of work is a comfort around blood and bodily fluids. Depending on which area you choose for specialisation – microbiology, immunology, haematology and many others – you could be working with samples of urine, blood or stool. You also need to be well-versed in computer and technology applications, particularly given the trend towards electronic records. You will be working with sophisticated technology to create and maintain patient records. Confidentiality is another necessary aspect of this kind of work, which ensures that a patient's privacy and sensitive health information are respected. Your work will help to diagnose diseases such as cancer, diabetes and infectious diseases. You may also identify bacteria and viruses or detect drugs of abuse. All of these tests generate large volumes of data, which you will need to carefully and accurately record. If you are considering a career in laboratory science, you should have excellent motor skills, hand-eye coordination along with good time management skills and communications skills. You also need to be capable of reading graphs and charts as well as working well independently and in a laboratory team. If you do not want to invest the time and money to train for an undergraduate degree in the biomedical sciences, then you can work as a laboratory technician or assistant instead of a scientist. Usually, a year of university leading to a certificate is sufficient to work as a medical laboratory assistant. Those who complete a diploma over the course of approximately two years will work as technicians while those who work as scientists will have a degree and practical training, plus the appropriate national registration. Often, you will be hired immediately following graduation, where you will work for a year or two in a trainee role before becoming registered. In a typical day, you will process and analyse laboratory specimens and samples, maintain instruments used for analysis and produce accurate findings after the analysis is complete. Those who work in more clinical roles will have greater responsibility such as evaluating results and problem-solving as well as researching and testing out new methods of analysis. You may also be involved in training new graduates or providing teaching to those enrolled in university programs. The demand for laboratory scientists is expected to grow by ten to twenty percent before the end of this decade. The average starting salary is approximately £23,000 but easily reaches £35,000 or more as you gain experience. Those who work in laboratory management will make in excess of £45,000 per year. With shortages of qualified laboratory workers in many geographic areas, graduates usually find that they can obtain employment quite rapidly. If laboratory work is exciting and challenging for you and a career at a desk or out in the public is far from appealing, then consider a medical career in laboratory science. Whether you want to work in a more supportive assistant or technician role or you prefer greater responsibility in a scientist role, there is a place for you in the laboratory that best fits your education goals, skills and needs. You can play an important role in analysing patient samples to help physicians make accurate diagnoses and provide effective treatments to improve patient health outcomes.